The assassination of Albrecht von Wallenstein by the Scottish and Irish officers led by Colonel Walter Leslie. Alexander Leslie, Earl of Leven, field marshal in the Swedish army in Germany, Governor of the Baltic Provinces and victor of Wittstock in 1636. 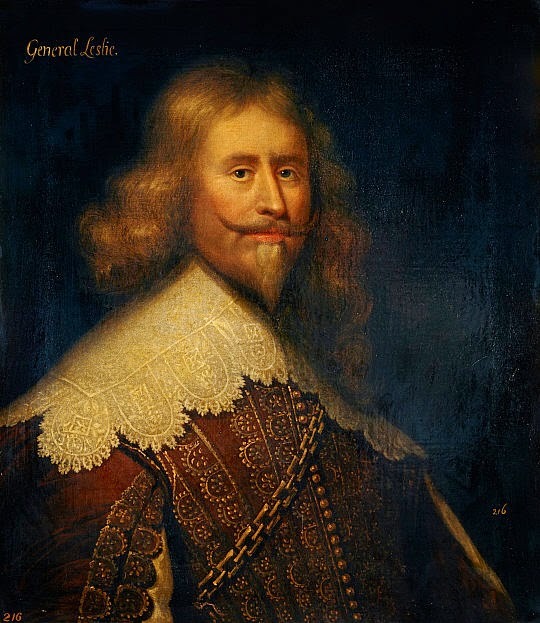 In 1624, Walter Leslie crossed the North Sea to fight with the Protestant Army of the United Provinces. By 1628, he was in Stralsund in Northern Germany fighting for either the Danes or the Swedes. In 1630, he transferred to the Imperial Army and fought alongside his countryman John Gordon that summer in War of the Mantuan Succession in Northern Italy, under the command of General Albrecht von Wallenstein. Wallenstein was recalled from Italy in 1631. 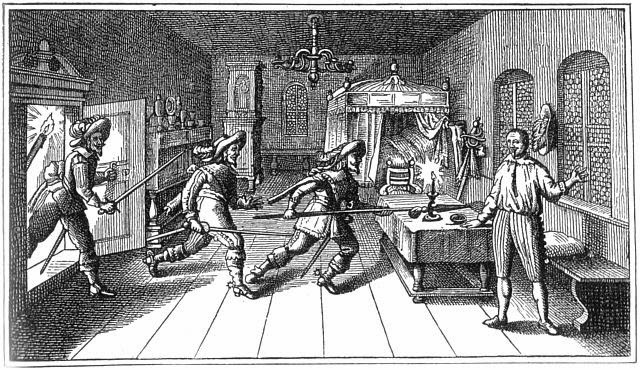 In December 1631 Leslie followed the General to fight in Northern Germany against the Swedes. By July 1632, Leslie had risen to the rank of oberwachtmeister, or sergeant in the infantry ranks of Count Adam Erdmann Trčka, Wallenstein's brother-in-law, and was still under John Gordon, then Lieutenant Colonel. The military relationship between Leslie and Gordon would become increasingly important as they became closer to Wallenstein. Leslie fought under Gordon at Bentheim in lower Saxony and at Freistadt in upper Austria. Both men were captured at Freistadt by the Swedes after having had joint command of 1000 Scottish and Irish musketeers. After that, Gordon rose to commander of a regiment and Leslie became his spokesman in court. This was the first time Leslie was put in such a position, although it would not be the last. 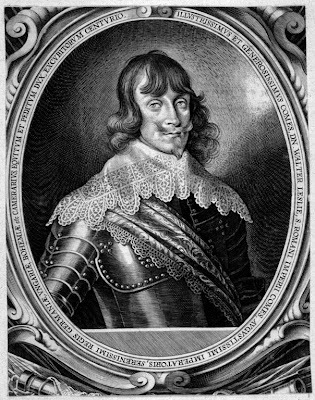 In November 1632 Leslie fought with Gordon at the Battle of Lützen. That was a Protestant victory, but cost the life of Gustavus Adolphus of Sweden. After that, they captured Eger and Leslie was again commissioned as Gordon's second in command. Reports of events differ slightly in the small details but what is agreed is that at the end of dinner, Leslie, Butler and Gordon all stood up, drew their swords and yelled something along the lines of "Long live Ferdinand and the House of Austria!" At that point, the drawbridge had been raised and the Irish dragoons had been let into the banquet hall. Although Leslie was wounded in the slaughter, all of Wallenstein's officers were killed. Next, Leslie left the walls to gather Walter Devereux and a team to go to Wallenstein's quarters, where he was asleep, and kill him, and so they did. The peoples of the British Isles served in most of the armies of continental Europe besides that of the Dutch Republic during the seventeenth century. The need for military manpower increased when the Thirty Years War began in 1618 and the Eighty Years War resumed in 1621. Gentlemen volunteered for reasons of religious fervour, honour, glory, military adventure and experience, while humble folk were more often recruited under compulsion. Young men of military age from Scotland and Ireland were also susceptible to the inducements of lairds and clan chieftains, and some Irish and Scottish regiments contained sizeable kinship and clan groups. The governments of the Three Kingdoms assisted this compulsory recruitment because they wished to rid their realms of idle swordsmen and vagrants and send them into what often amounted to perpetual exile. However, the efforts of military enterprisers, who recruited whole companies and regiments for profit, were successful beyond the sporadic efforts of officials of the Three Kingdoms. While most Englishmen preferred to serve in the States' Army, the Scots were to be found everywhere, but especially in the Swedish army in the time of Gustavus Adolphus and in the army of Denmark-Norway under Christian IV. The Catholic Irish, urged on by their priests, preferred Spanish service-especially in the Army of Flanders-but also maintained a significant presence in the French army after that country entered the Thirty Years War in 1635. Following the regal union of England and Scotland in 1603, the possibility of war between those two kingdoms diminished, and Scottish soldiers were no longer needed at home. Likewise in Ireland, the end of the Tyrone Rebellion or Irish Nine Years War and the Anglo-Spanish War made soldiers-whether English or Irish-redundant in that kingdom. The governments of both Scotland and Ireland embarked upon a policy of supplying the needs of military enterprisers recruiting for mainland European armies and making life difficult for swordsmen who tarried too long before accepting enlistment and exile. That discharged soldiers and idle swordsmen were a threat to domestic stability had long been recognized. Sir William Stanley's Regiment, which defected from the States' Army to the Spanish Army of Flanders, had been recruited from among English and Irish soldiers discharged from the English army in Ireland. Although Stanley's desertion with his whole regiment gave Irish soldiers a bad reputation among Protestant princes and military commanders, one Captain Dawtrey asked Sir Robert Cecil in July 1594 to be allowed to raise a regiment of 1,500 to 2,000 native Irish for service in Brittany. Dawtrey insisted that the native Irish made very good soldiers when sent overseas, and that Cecil should not be influenced by Stanley's bad example. All governments regarded discharged soldiers as a threat to stability. In England, after 1588 government policy and legislation also attempted to discourage discharged soldiers and sailors from returning from overseas expeditions by treating them as vagrants and masterless men. Discharged soldiers and sailors were especially troublesome when demobilized without full pay-as often happened- and despite official discouragement, congregated in London and its suburbs where they participated in riots during the war years of the 1590s and 1620s. Following the end of the Tyrone Rebellion and the Anglo-Spanish War, the English government of Ireland decided that Irish swordsmen must be removed because, being regarded as uncivilized, adverse to labour, unregenerate and stubbornly Catholic, they could not be incorporated into planter society. Under the terms of the Anglo-Spanish Peace Treaty of 1604, the British Isles became neutral territory for recruitment by foreign armies. In 1609 the Irish government estimated that there were some 12,000 idle swordsmen who continued to be followers of the Irish lords and chieftains, and, from the time of Lord Mountjoy, the lords deputy had encouraged them to follow their martial inclinations elsewhere. With the inauguration of this policy down until the Irish Rebellion of 1641, the Irish and English governments did not much care where Irish swordsmen went as long as they were gone. They actively cooperated with military contractors and recruiting officers to pack them off to the Protestant powers of the Netherlands, Denmark and Sweden, but also allowed Irish recruiting officers from Poland, Spain and Imperial Austria to come to Ireland and enlist volunteers. The earlier drafts of Irish soldiers for the Spanish Army of Flanders-especially those of 1586, 1605 and 1621-appear to have been made up mostly of volunteers, but many of those who went elsewhere were impressed. Sir Arthur Chichester, lord deputy from 1604 to 1614, claimed to have sent 6,000 men to Sweden. Following the flight of the Irish earls in 1607, 1,200 of Tyrone's own vassals and retainers were forced to enter the service of Sweden and Muscovy in one year alone. In a battle between the Russians and the Poles, seven companies of Irish deserted the Muscovite army, and the Russians killed the remaining two companies of Irish in retaliation. Those Irish sent to serve the kings of Denmark and Sweden were also disgruntled, and their priests, who accompanied them disguised as common soldiers, incited mutinies. After 1631 Gustavus Adolphus refused to accept any more Irish troops.